Sometimes the cause of your watery eyes will be obvious – for example if you have an infection, turned-in lashes, or conjunctivitis. If the cause isn't obvious, you will need more tests to find out what is happening – contact your optometrist or ophthalmologist (eye doctor). The tests you have will depend on how much your eyes are watering, and how much it bothers you. Some of the tests are part of a normal eye examination. Some may involve using a dye to show your cornea (the front of your eyes) and tear layer more clearly. They may also measure how many tears you make, and how quickly they evaporated. If you appear to have blocked tear ducts (nasolacrimal ducts), an eye specialist may numb the area with a local anaesthetic and examine your tear drainage channels. They may push a very thin probe, or stick, into your drainage channel to see if it is blocked. They might also syringe fluid into the tear duct to see if it comes out in your nose. If there seems to be a blockage then you might have an X-ray after a dye is injected into your tear duct, to show exactly where it is blocked. using artificial tears (if your eye is producing too many tears to compensate for being dry). There are many brands of artificial tears you can buy without a prescription. Talk to your eye-care provider about which one is best for you, and follow the manufacturer's instructions. If your eyes are no better after a couple of weeks, try a different brand. Surgery might help if your eyelids are turned outwards (this is called ectropion). This is a common operation. It is done with a local anaesthetic injection that numbs the area. If your tears aren't draining properly, you are likely to have surgery to help them drain. 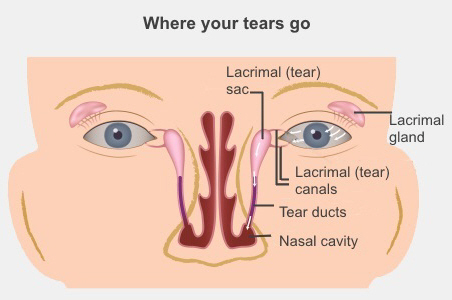 The usual operation makes a new channel to the inside of your nose, which your tears can drain through. The operation is called a dacrocystorhinostomy (dac-ro-sys-toe-rhi-nos-tomy) or DCR. Another less common operation uses a tiny balloon to make the tear duct wider, or inserts a small device (called a stent) to hold the tear duct open. Watery eyes are not usually an emergency. But if you also have red eyes, discharge from your eyes, pain in your eye or nose, or if your eyes have been watering a lot for a long time see your optometrist, ophthalmologist (eye doctor) or GP. These symptoms can suggest a more serious problem. To help avoid watery eyes, make sure you wear sunglasses when you are outside, to protect your eye from UV rays and dust, and to reduce glare. American Academy of Ophthalmology – What is a blocked tear duct? More information about causes, symptoms and treatment of blocked tear ducts. It includes a short animated video. Written by Canterbury optometrists. Adapted by HealthInfo clinical advisers. Endorsed by clinical director, Ophthalmology, Canterbury DHB. Page created August 2015.